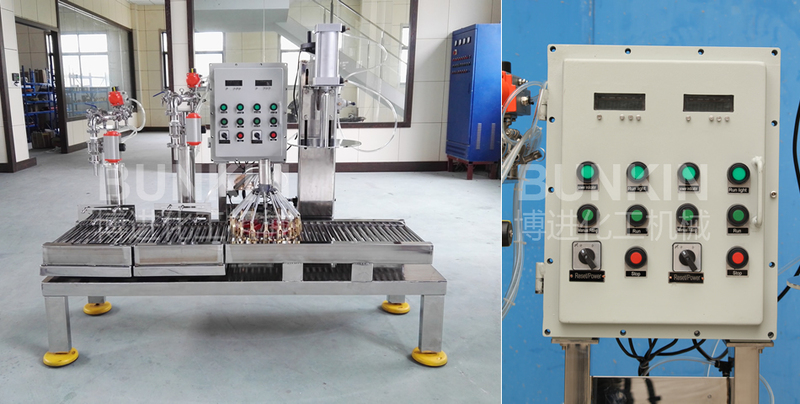 Two Nozzel filling machine_Anhui Bunkin Chemical Machinery Co.,LTD. Applied materials: Suitable for industries such as coating, ink, adhesive, resin, chemical solvents, lubricants, pesticides, etc. 1. The filling machine adopts high precision gravimetric measuring software system, so the measuring result is very correct. 2. There are fast and slow feeding valves, fast valve increases filling speed and slow valve ensure filling precision greatly, which also controlled by pneumatic system. 3. Widely measuring range and the accuracy is just +-10g/barrel. 4. Filling nozzle adopts anti-leaking type, which make sure that there is not any airs into the filling materials. 5. 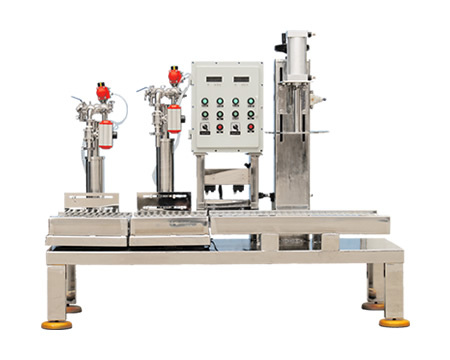 Feeding and filling automatically, equipped with pneumatic nipping and capping device for 1-30KG capacity depended on the model.